30 | BROADBAND COMMUNITIES | www.broadbandcommunities.com | MARCH/APRIL 2015 BROADBAND POLICY Harnessing the Potential Of Gigabit Cities Participants in the Gigabit City Summit explored the ways in which cities can take advantage of next-generation broadband infrastructure. By Denise Linn / Harvard University J anuary was an eventful month for the Internet in America. President Obama traveled to Cedar Falls, Iowa, and publicly supported a city's right to build its own high- speed Internet infrastructure. Meanwhile, a coalition of local leaders from across the country gathered in Kansas City, Mo., for the 2015 Gigabit City Summit [January 13–15, 2015]. Representatives from dozens of cities, as well as from partners such as Code for America, Cox and Mozilla, came together to discuss key questions: What can an American city do with Internet speeds of 1 gigabit, 100 times faster than today's average? How can a city make sure all citizens, businesses and schools beneft from these advancements? 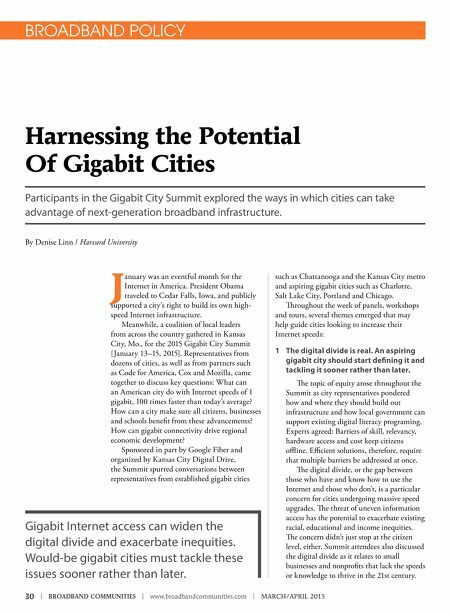 How can gigabit connectivity drive regional economic development? Sponsored in part by Google Fiber and organized by Kansas City Digital Drive, the Summit spurred conversations between representatives from established gigabit cities such as Chattanooga and the Kansas City metro and aspiring gigabit cities such as Charlotte, Salt Lake City, Portland and Chicago. Troughout the week of panels, workshops and tours, several themes emerged that may help guide cities looking to increase their Internet speeds: 1 The digital divide is real. 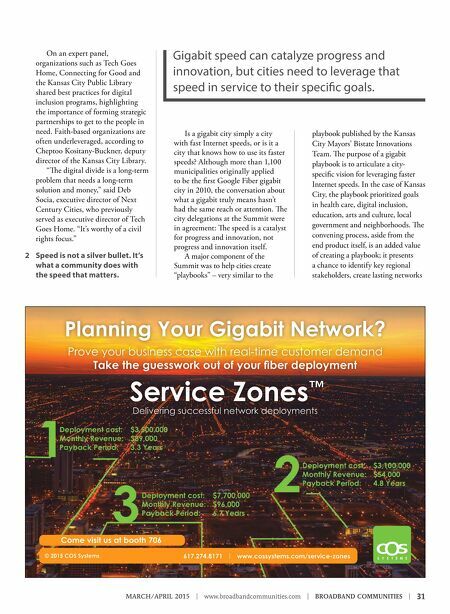 An aspiring gigabit city should start defning it and tackling it sooner rather than later. Te topic of equity arose throughout the Summit as city representatives pondered how and where they should build out infrastructure and how local government can support existing digital literacy programing. Experts agreed: Barriers of skill, relevancy, hardware access and cost keep citizens ofine. Efcient solutions, therefore, require that multiple barriers be addressed at once. Te digital divide, or the gap between those who have and know how to use the Internet and those who don't, is a particular concern for cities undergoing massive speed upgrades. Te threat of uneven information access has the potential to exacerbate existing racial, educational and income inequities. Te concern didn't just stop at the citizen level, either. Summit attendees also discussed the digital divide as it relates to small businesses and nonprofts that lack the speeds or knowledge to thrive in the 21st century. Gigabit Internet access can widen the digital divide and exacerbate inequities. Would-be gigabit cities must tackle these issues sooner rather than later.